The title of the installation Der Tagesbogen refers to an astronomical phenomenon – that part of the ostensible star road corresponding to the mathematical horizon – while metaphorically pointing out the idea of disappearence. The gravity of plasterboard walls, built over the atelier of the artist, displayed in the spaces of Walcheturm, stops on objects and artworks in the studio forcing a fragile equilibrium. Out of the visible angle of the light, during the twilight, only the contours of the objects stay present to our view. Still their visions and contours become the artist’s attempt to fix them. 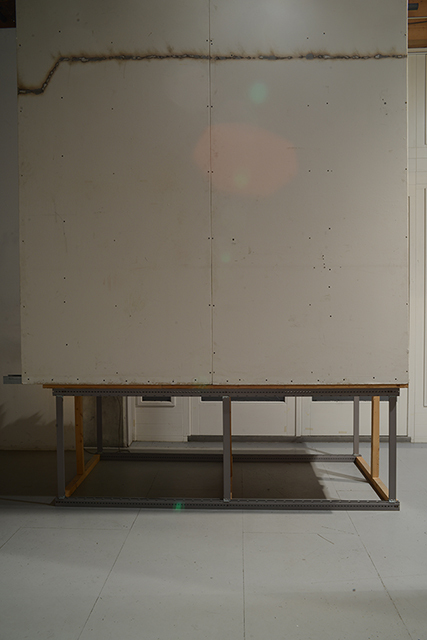 In between artworks, fragments, and research material, spread into the room and on the tables, the interwoven space made out of older plasterboards walls and fences, hides continuously parts of the view, interrupting and blurring the vision.